Elegant Eyebrows is an expert in the fine art of threading and can transform your eyebrows, creating a defined beautiful and sophisticated look. An ancient hair removal technique, threading is a popular alternative to plucking and waxing and effectively deals to unwanted facial hair. 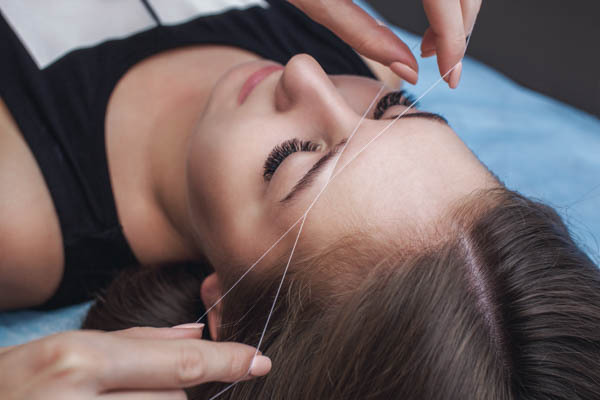 Using a thin cotton thread, threading removes the entire hair follicle, is faster than tweezing and is perfect for those who suffer from skin irritations or allergies. No hair is too thick or thin for threading and hair grows back thinner and finer. Tame sparse, overgrown or wild eyebrows and take that first step towards better brows by heading into Elegant Eyebrows. The team does eyebrow tinting, eyelash perming and eyelash extensions. • Threading only removes hair and not skin. • Threading is chemical free and better for sensitive skin. •Threading lasts longer than plucking or waxing. •Threading is more precise and gives a more defined finish. • It is generally agreed that threading is not as painful as waxing and other hair removal procedures. •The technique grabs even the shortest hairs, giving a smooth finish.